All sales go to Aerospace Valley Robotics which is a 501(c)(3) not-for-profit organization incorporated in Lancaster, CA, with a mission to promote robotics, science, technology, engineering and math in the Antelope Valley through educational programs, hands-on opportunities, competitions, mentorship, and scholarships. Challenge coins began in the military to show your allegiance to your organization or as a token of the organization's appreciation to a guest. 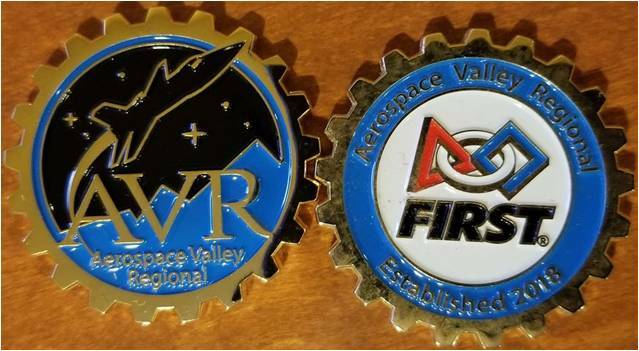 The Aerospace Valley started this tradition at our inaugural regional in 2018. At this time we are just taking pre-orders for the 2019 coins. They are priced at $7 for individual coins or $5 each if you order 10 or more (Shipping is separate). Coins will be available while supplies last. We also have a few 2018 coins available for sale at $4/each. Emails will be sent for payment and delivery options. Please use the form below to pre-order coins. Thank You. Email is optional. If provided, we would only email you if the coins go on sale. We will send you an email with payment and delivery options.